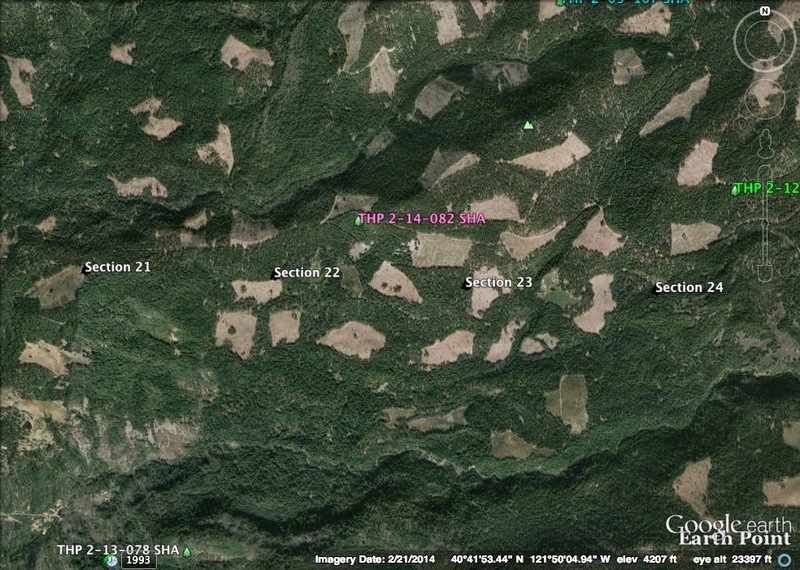 THPBlog: Roseburg Resources Company to clearcut log east of Redding, CA. Roseburg Resources Company to clearcut log east of Redding, CA. This THP is about 25 miles NE of Redding, CA and about 6 miles SE of Round Mountain and Highway 299 at an elevation of 3,480 to 4,680 feet. Roseburg Resources Company is planning a clearcut tractor and cable logging operation in Douglas fir, white fir, incense cedar, sugar pine and ponderosa pine forests. They are planning to use tractors inside areas designated for cable logging for site preparation, and to use existing seasonal road 210B12 inside a class I watercourse. 11 road drainage sites are planned for work including rocking, dip construction and culvert repair and replacement. Three populations of rattlesnake fern were found In units 2222W and 2224W, scalloped moonwort was found in section 24, butte county fritillary was found in section 21 and giant checker bloom was found in sections 23 and 24. More information is available on the THP Tracking Center website.